"Giant" is a flexible system in relation to trading strategies. 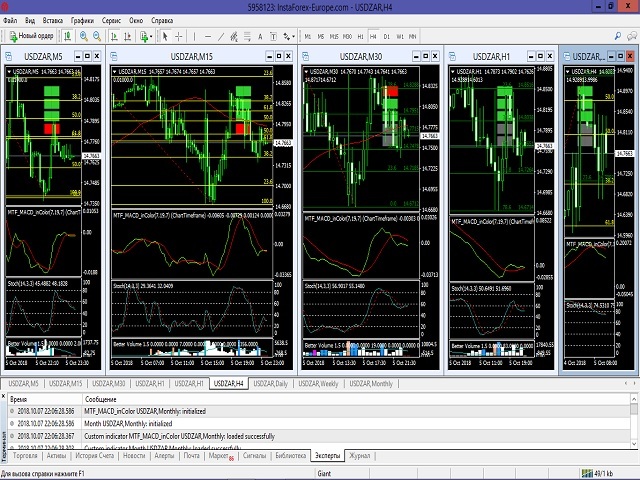 It consists of two high-quality indicators that are installed on five different timeframes of the same currency pair (see screenshot). It monitors the trend and gives signals to open. The system passed a large number of checks and showed high accuracy. Indicators are sold separately. The second word in the main name is the indicator itself. This issue sells the indicator "Attention". The purpose of the system is to simultaneously display indicator signals on different timeframes. The "Attention" indicator is set on the M5 and M15 charts. The "Nicely" indicator is installed on the M30, H1 and H4 charts. After the indicator "Attention" will give the opening signal on the chart M5, wait for the signal indicator "Nicely", set on the M30 chart. At the same time, the price should touch or be close to the automatic Fibonacci levels on the M30 and H1 charts (simultaneously on both charts). The last condition: on the M5 chart, you need to additionally set the stochastic, which must be below the level 20 (with a buy signal) or above the level 80 (with a sell signal). It is desirable that there was a divergence on the charts M5 and H1. If there is no divergence, it is better to wait for it. The "Nicely" indicator on the H1 chart confirms the signal, and on the H4 chart it monitors the trend. The signal of the "Attention" indicator on the M5 chart. The signal on the "Nicely" indicator installed on the M30 chart. The price is near the Fibonacci levels simultaneously on the charts M30 and H1. On the M5 chart, the stochastic is below level 20 or above level 80. 5. Divergence on the M5 and H1 charts is not a prerequisite. The principle of operation of the indicator "Attention"
The indicator uses the strategy of "Three screen elder". The author's improvements have found an unusual and very effective way to search for a signal. The indicator has a signal panel, usual for the indicator "three elder screens", as well as alerts, but in this case they are only auxiliary. The real signal of this indicator is a bright horizontal line. If it appears above the price level, you need to prepare to buy. If lower prices, to sell. When the line disappears, we prepare for a price reversal. Of course, you need to wait for all the necessary conditions for the opening of the transaction. Parameters of the "Attention" indicator"